Winter is here, and the rains have started. Or at least – we had two weeks of rainy weather, and now we have Melbourne winter weather. Cold and dry. It’s lovely for going out in, but my poor baby trees need the wet. K commented the other day that being a permahippy has the unexpected consequence of making you respond to a rainy day with excitement and happiness. 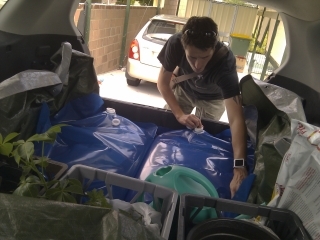 So much precious water, so many things that can grow as a result. The current objective is to extend the tree cover as much as we can before next summer, to provide shade for planting fruit trees, and to start building soil. 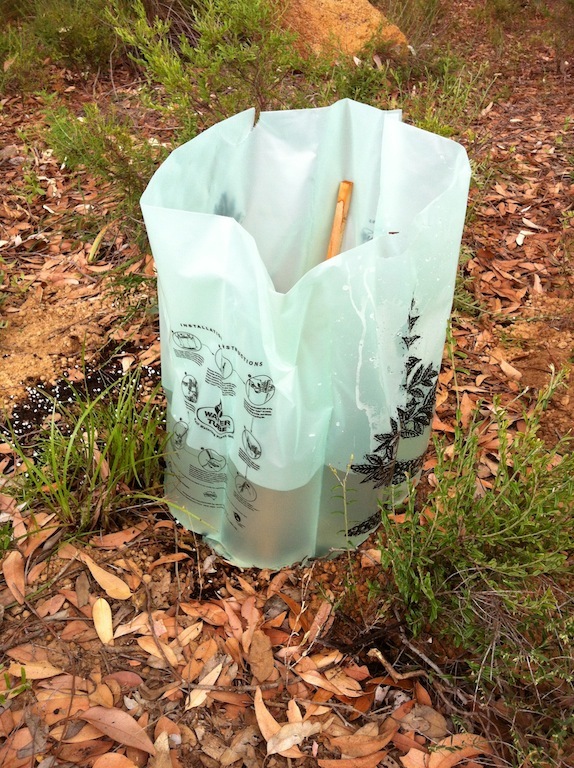 With that in mind, we’ve been planting seedling trees, which are doing beautifully so far, and we’ve seeded the swale mounds with broad bean (Vicia faba), green lentil (Lens culinaris), and lupin bean (Lupinus spp.) seeds, which are all sprouting. It’s very exciting. We’ve made (or attempted) a first generation of seed balls, containing some tough, drought tolerant tree seeds (mainly wattles and black locust), pioneer shrubs and groundcovers, and flowers. Flowers for our soon-to-be-established bees, to bring birds and insects onto the property, and just for the joy of flowers – which is, I think, a highly underrated motivation. The seed ball making wasn’t a complete success. It’s difficult to get red clay powder, or in fact any powdered clay, here so we used bentonite clay which is sold to be dug into garden beds to assist with water retention. It works, but it isn’t ground up very finely, and when you add minerals to it in the form of rock dust it ends up being quite gritty. On top of that, our compost was a little bit gritty as well, with wood fibre in it that hadn’t completely broken down. As a result, our mixture was reasonably granular, and didn’t nucleate as well as I’d hoped. We did make seed balls, but it didn’t go as smoothly as expected. Lessons for next time? Don’t add rock dust – just sprinkle that out separately on the ground when we broadcast the seed balls. Use the finest clay powder available. Use a more fine-textured compost. I should relax and not be quite such a perfectionist about it. UPDATE: And after all that, the seed balls worked out fine. We broadcast them last weekend, as well as digging some more swales and starting the Polish swales, and planting another load of tree seedlings. 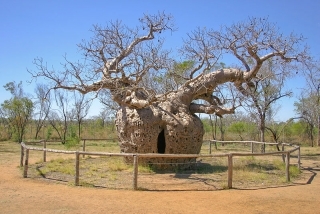 Most people have barely heard of baobabs, or boabs as they’re more commonly called in Australia. 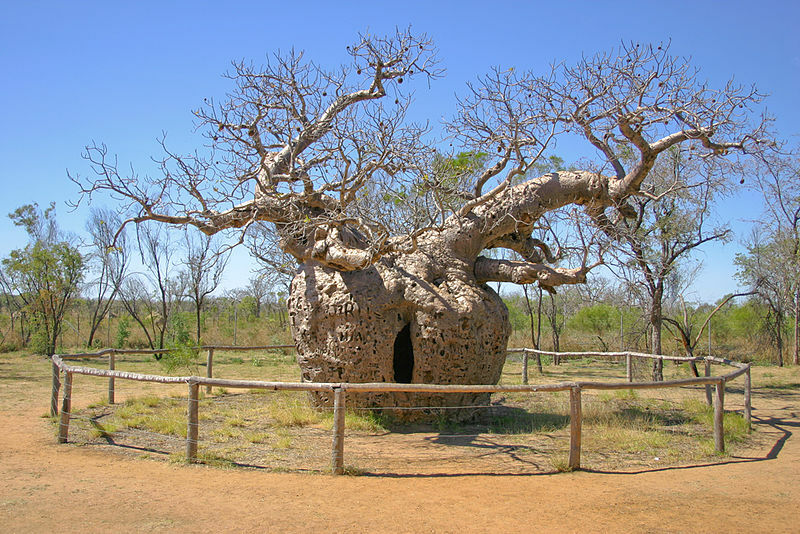 It’s odd, since we’re one of the few places in the world which has a native baobab species – the Australian Boab, Adansonia gregorii. There are only eight species of baobab. 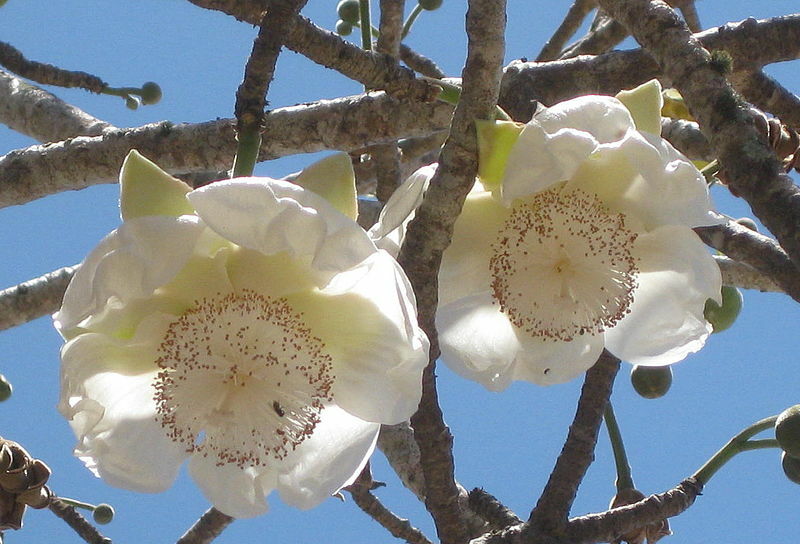 Of the other seven, one is native to Africa (Adansonia digitata, the African Baobab), and the other six (Adansonia grandidieri, Adansonia madagascariensis, Adansonia perrieri, Adansonia rubrostipa, Adansonia suarezensis, and Adansonia za) are endemic to Madagascar. 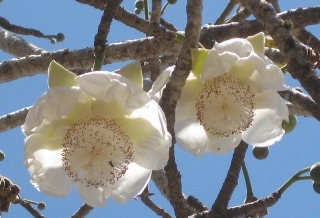 All baobabs are extremely drought tolerant and hardy. Some are as little as 3m tall, while others are up to 30m in height, but all have massive trunks which can reach 15m in diameter. 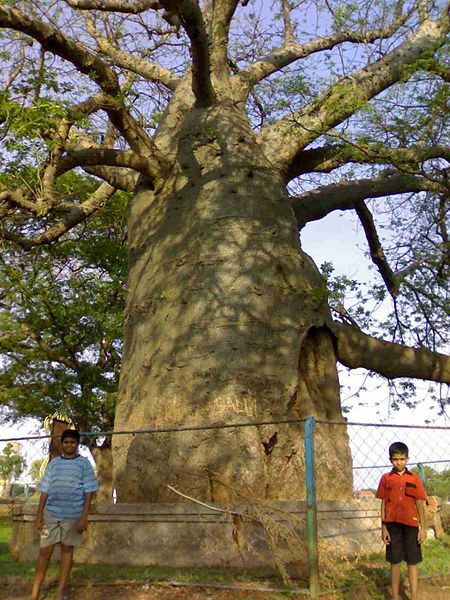 The massive trunk may be cylindrical, bottle shaped, tapering, or irregular; thick tapering branches resembling a root-system extend from the trunk, which is why baobabs have often been referred to as upside-down trees. The wood is fibrous and soft, under a thick layer of bark, and stores water for dry periods. The wood can be chewed to provide moisture and relieve thirst; humans as well as certain animals eat it in times of drought. The roots can be tapped for water. The trunk of the tree often develops a hollow, which fills with water during the rainy season and acts as a reservoire during the dry season. Water inside the trunk of a baobab remains potable for months, apparently due to natural preservatives leached by the living wood that keep water from fouling. This may be an adaptation to prevent microbes breeding in the water and infecting the tree, which may have water in the trunk for several months or even years at a time. Baobabs are semi-deciduous, and may lose their leaves and become dormant for several months of the year. This period depends on the environmental conditions in the area. Under good conditions, growth can be quite rapid, up to 2m in 2 years. Trees will begin producing flowers and fruit after 8 – 25 years, and some species may live for up to 1000 years. Flowers are large, showy, and highly scented. Although pollinated by fruit bats, the flowers are also a favorite nectar source for bees. The fruit consists of a hard, woody outer shell surrounding an arrangement of segments similar to those of a citrus fruit, with angular pockets of soft pulp surrounding a cluster of hard, black, kidney-shaped seeds. 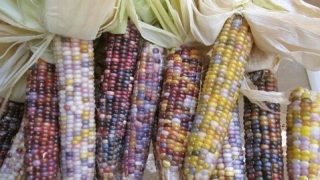 The pulp may be white, yellowish or pinkish in color, and is dry when ripe. It is rich in vitamin C, provitamin A, B complex vitamins (B1, B2, B6), calcium, phosphorus, and iron, and is described as having an acid gingerbread flavour. It forms a mealy solid, but a few hours in the sun dries it into an off-white powder. It can also be beaten into thin, leathery pancakes which can be stored for an extended period. This powdery substance is soaked in water to provide a refreshing drink somewhat reminiscent of lemonade, which is also used to treat fevers and other complaints. The seeds are also reported to be edible. Each matured plant may produce 30 kg or more of fruit per year. Harvest the fruit when it falls to the ground, or pick ripe fruit if it can be reached. The fruits themselves are unusual in that they remain dangling during the dry season long after the tree sheds its leaves. They are also unusual in remaining edible far past the point where other fruits would have decayed into putrefaction. Stored under normal ambient conditions, they keep for up to 3 months. Seeds can be collected from picked or fallen fruit. 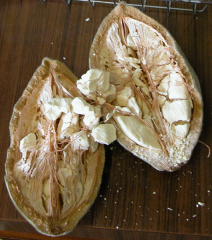 After crushing the hard woody shell of the fruit, the seeds can be extracted from the dry acidic pulp. Baobab seeds have very hard seed coats and germination is usually less than 20%. In nature, dormancy is broken by passage through the digestive system of large mammals. In cultivation, dormancy may be broken by immersing the seed in hot water for five minutes, by manually scarifying the seed coat, or by acid scarification for 6 – 12 hours. 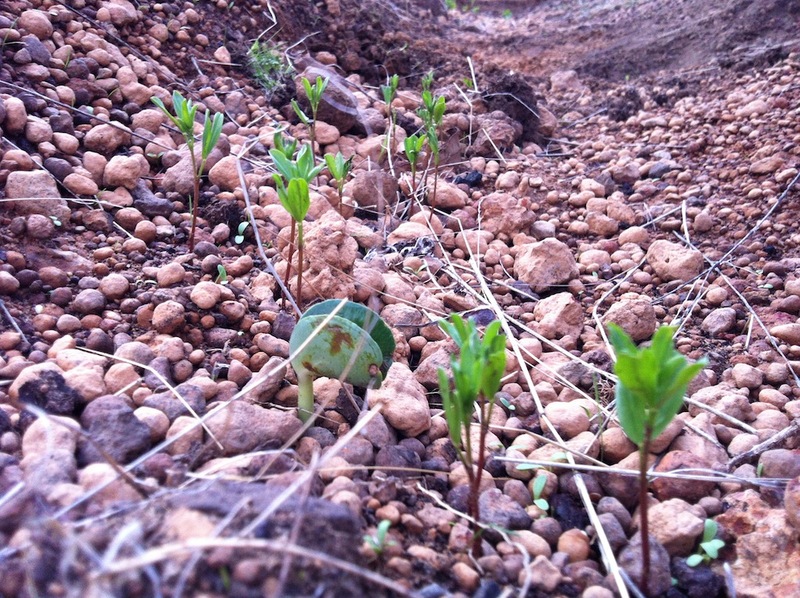 Unless pretreated, seeds can take a year to germinate. 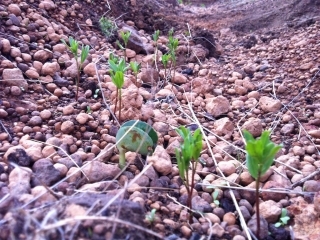 Seedlings have big, flat and paired cotyledons, and the first leaves are generally narrow, simple and linear. 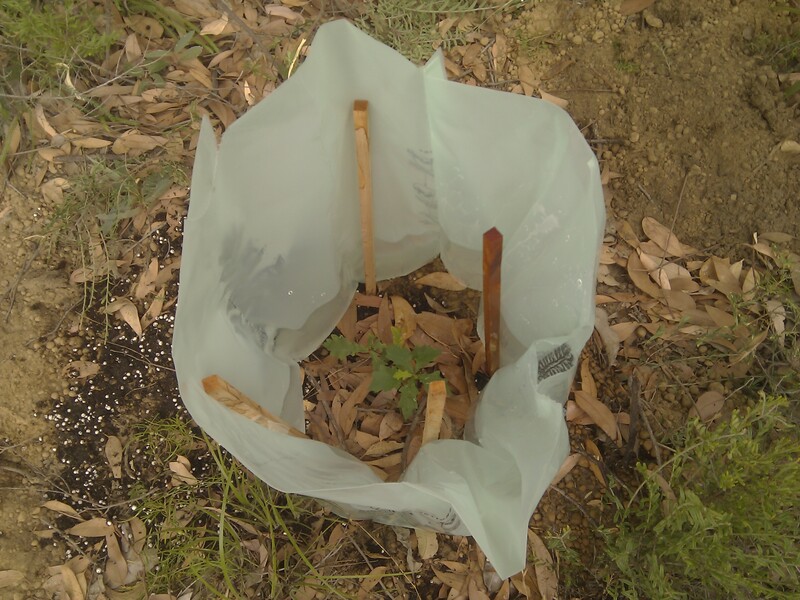 Effective protection against livestock is essential after planting the seedlings. 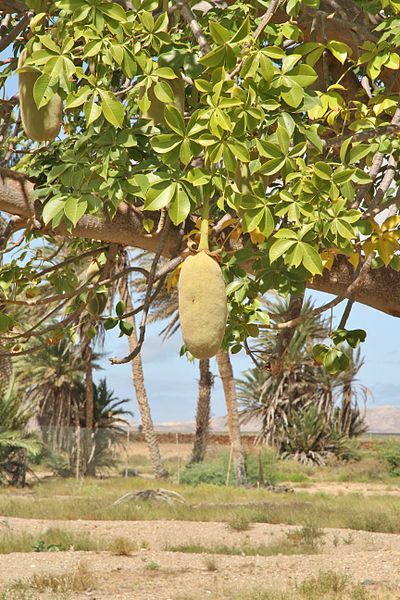 The leaves (of at least the African Baobab) may be eaten as a green vegetable, sometimes steamed and eaten as a side-dish like spinach, but most often ground up in soups, stews, sauces, relishes, and condiments. 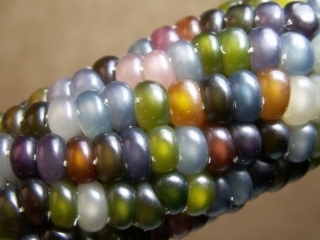 They contain high levels of provitamin A. The leaves may be dried, and keep well in this form, without losing their glutinous polysaccharides. To maintain a high level of provitamin A level in dried leaves, it is important not to dry the leaves in the sun. The sprout of a young tree can be eaten like asparagus, and the tap root of very young trees is also edible. Water – anywhere from 200 to 1200mm of rain or irrigation per year. 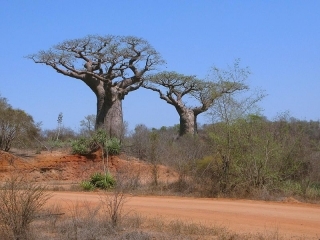 Baobabs are very tolerant, and can survive both arid and subtropical climates. Sunlight – Lots of it. 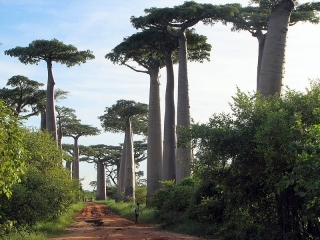 Baobabs naturally grow as solitary trees, or as top level canopy trees.. Soil – They will grow on many different soils, but deep, calcerous soils are best. Baobabs reportedly tolerate laterite as well as relatively alkaline (e.g. limestone) soils. Space – Baobabs are large trees, up to 30m tall and 10 – 15m in trunk diameter. They grow slowly, but wherever you plant a baobab you must plan for it to expend over its lifetime. Water storage in trunk hollows, and an emergency water supply in the wood itself. Seeds, which can be grown into more baobab trees, either to plant out or for their edible tap roots. Soggy or waterlogged soils, or even seasonal inundation. Seed balls are an ingenious idea, developed and pioneered by Masanobu Fukuoka. 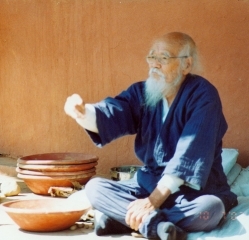 Fukuoka was a Japanese farmer and philosopher, and an early proponent of natural farming. He suggested that much of the effort that humans put into agriculture is wasted, and that we should instead be working with the natural environment. Seed balls are one way of doing that. It’s a very simple idea. 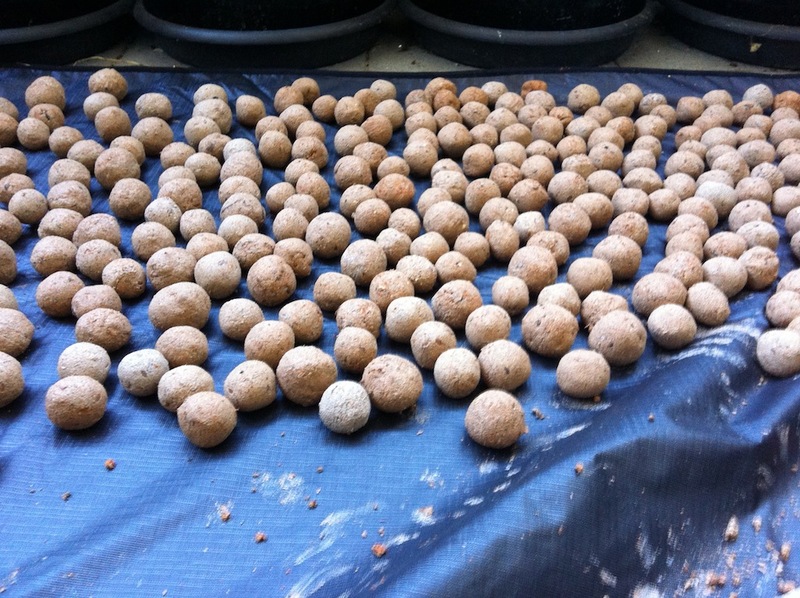 Seed balls are simply scattered directly onto the ground, and not planted, which provides a huge reduction in the time and effort to plant any large area. The clay protects the seeds from birds, insects, and harsh weather conditions until enough rain falls to melt the clay and germinate the seeds. The seed ball contains a mixture of different seeds, and their planting is left to the elements and random selection, so that the most appropriate plant in the most appropriate position will emerge, and require the least attention. 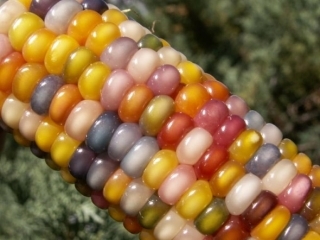 Seeds can be mixed to form deliberate companion planting guilds, or a variety of seeds can be included to ensure a varied ecosystem results. Many people include chilli powder, mint, or pennyroyal to repel ants from digging the seeds out of the seed balls, and you can also add inoculant for legumes and the spores of mycorrhizal fungi to encourage a healthy soil ecosystem from the start. We tried an initial round of seed ball making, using 1 part seeds to 3 parts vermicompost, 1 part chilli powder, 5 parts bentonite clay with added minerals, and approximately 2 parts water. Red clay powder is hard to get here, and the only benefit in using red clay over bentonite is the mineral content. 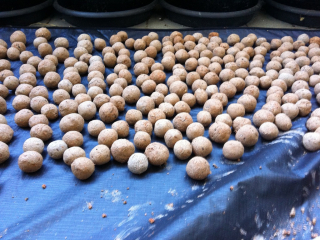 Conclusion: hand rolling around 600 seed balls takes a long time, and it gets really easy to roll them too big. It was fun, but I think it would quickly get to be less fun considering that for our 7.5 acres we expect to need something like 300,000 seed balls (at a recommended application rate of ten seed balls per square metre, or more to reclaim derelict land.). Automation beckoned as a solution. 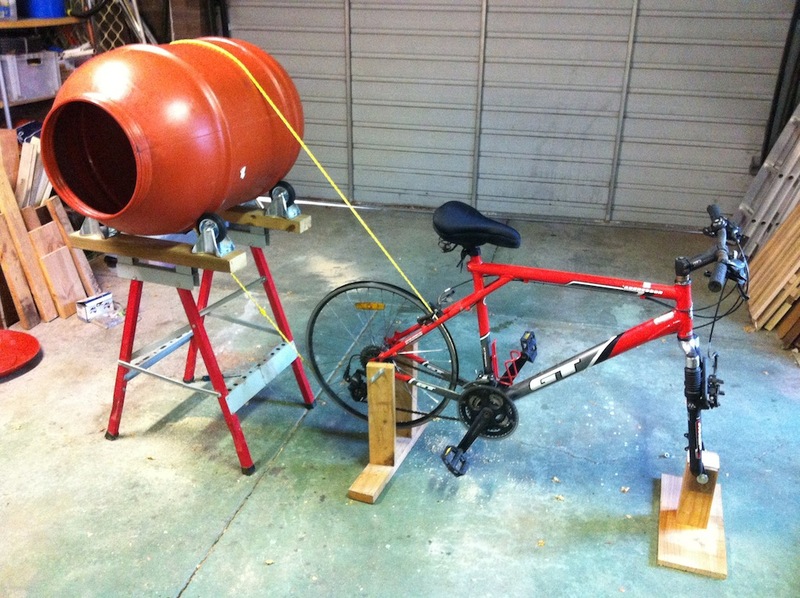 The internet abounds with ideas and designs for machines for making seed balls. The basic premise is a barrel or drum and a mechanism to roll it in place. The dry seed ball mix is introduced into the rolling drum, and water is sprayed onto the dry mix until it begins to nucleate and form small balls. A mesh screen is used to catch seed balls once they reach a certain size and remove them from the drum. The machine is simple and straightforward, and we would have gone ahead and built one with a motor to roll the barrel, just like all the rest on the internet, except that I saw Milkwood Permaculture’s bicycle powered machine. It’s ingeniously low tech, and can run anywhere without needing a battery or an electricity outlet. As far as I can tell, it’s also the only bicycle powered seed ball machine anywhere (or at least, the only one on the internet). Until now. One recycled bicycle frame, modified plastic olive barrel (also recycled, and thoroughly cleaned of olive flavoured brine), some wood and stretchy rope later – we have The Machine. It hasn’t yet had its inaugural use, but it spins perfectly. Watch this space for updates.